I just got back from Boardmasters Festival in Cornwall with some friends from college, and it was absolutely incredible! I had such an amazing time and I made so many new friends; I can’t wait until next year. It was my first festival, and I had been really excited about it for months. I spent months listening to the artists on the lineup and buying everything I would need for the 5 days I would spend there. The artists I was most looking forward to were Two Door Cinema Club, Alt-J, Becky Hill and Youngr. Somehow, I still managed to forget things that I really wish I had taken, so I am going to write a kind-of survival list of things that I would recommend taking. Just the basics though, because the list is endless! Make sure you have something that not only will be cool if it’s really sunny and beautiful weather but if the weather turns nasty, you need clothes to keep you warm and dry. You might think that shorts and a crop top will be fine with a rain coat on top, but bitter winds coupled with cold rain is not nice on bare legs. I recommend a pack-a-mac and a jumper, long trousers, like jeans, and long sleeved t-shirts. Just generally, something that will keep you warm and things you can layer together. Shoes are the same, but I wouldn’t recommend taking summery sandals or anything similar, as it can get pretty muddy even if it isn’t raining, so trainers and wellies are my staple festival footwear choice. To add some luxury, add wellie boot socks that will act as an extra layer of warmth on your legs! I took minimal makeup, so no foundation, concealer, contour etc. I took plenty of highlight and glitter, in fact probably enough glitter for the whole campsite, but you can never have enough! I also took things like colored eyeliner from NYX. For skin care, I took moisturizer, face wipes, extra sensitive baby wipes, deodorant, hand sanitizer and dry shampoo. I didn’t shower whilst there because the queues are crazy long and they are probably more dirty than clean! A baby wipe and deodorant is perfectly acceptable at a festival because everyone is the same, so don’t worry! And of course, I also took 50+ sun cream, but somehow managed to burn myself anyway so I would say to take after sun just in case. My biggest lesson learned from this experience; take a tent that is designed for more people that you are putting in it. I was in a two man tent with two of us, and our luggage and it just did not work. Luckily there was a backup plan, but it would have been uncomfortable otherwise. I took a self-inflating matt rather than an air bed, as then I didn’t need a pump, a sleeping bag, and a blanket which I doubled as a pillow at night. Another huge regret? I didn’t take a chair, so I either sat on someone else’s whilst they queued for an hour for the portaloos or I sat on the floor, which was no fun at night or in the rain! It might seem a hassle to lug around a camping chair, but it will be your best friend by the end of the weekend! This has to be one of the things I struggled with packing the most because I wasn’t sure what I would feel like eating. I took cereal bars, rice cakes, and pringles. It doesn’t sound appealing, but when I had had a few drinks, that’s all I really fancied. My friend also brought Chocolate Soya Milk and Coco Pops so we could all have a half-decent breakfast and I’ve never been so excited to eat cereal out of a cup with a plastic spoon! There are so many different foods stands there too, and yes it might be slightly more expensive than a McDonalds, but it’s hot food. When it’s raining and cold, a greasy burger is heaven. They even had a halloumi stand and I fell in love with the veggie burgers they were selling too. I drank a lot of water (and maybe a little alcohol too!) but I made sure to stay hydrated in general, mainly because I didn’t want to ruin my weekend with headaches and sickness. It’s obviously up to you how much you drink, and whatever else you do, but just remember that there is the morning after and all you have is a portaloo and maybe a dirty shower to help your hangover! I don’t think you can ever plan perfectly for these things first time, so mistakes are bound to happen, but preparation is key and I was really glad about the things I did remember to take. Make a list the week before, and make sure you have everything you need from the shops etc. and you don’t leave it to the last minute. Mainly though, have fun and go to artists you might not normally listen to because I can guarantee you’ll enjoy yourself even if you don’t know who they are! It was honestly one of the best weekends of my life and I can’t wait until next summer when I do it all again! I hope every body that went had an amazing time too, and I might get to see some of you there next year! Dungarees hey? The first time I wore dungarees was when I was a toddler, so it seems I am just wearing my old clothes again when I go shopping for the newest style. It seems to be the case with lots of new clothing ideas in the past few years. For example: Onesies, bodysuits, and dungarees. This doesn’t stop them being the most wanted style of the summer and certainly doesn’t stop them flying of the shelves, making retailers lots of $$$. I’m going to give you three different ways to style your dungarees. I own a pair of shorts dungarees and they are my go to fashion item if I want my legs out but not my tummy! You may be shocked to hear this, or not, but the easiest way to wear dungarees is with a basic plain or pattern tee underneath and a pair of fashion trainers! Most of the tee’s I were underneath my dungarees are striped and come from Primark! Not only is Primark great value for picking up all the different colours and patterns you could ever need, but the quality isn’t too shabby either. The material is soft against your skin and if you find a tiny mark or loose cotton when you get home from your shopping day, don’t take it back! (Unless it’s extreme, obviously!) The worn look goes perfectly with dungarees as denim tends to look worn even before you buy it, sometimes it’s even ripped! The t-shirts I own are plain two-toned striped short sleeve, which makes them ideal for underneath dungarees. These can, of course be worn on there own also and can look casual, laid back and are extremely comfortable. Here are some examples of stripes that are in the shops now, so go out and go shopping! These three are from New Look and are all around £10. You can find cheaper or more expensive ones elsewhere, so take your pick! All you have to do is search ‘striped t-shirts’ into any store’s site and hundreds of results will pop up. Off the shoulder tops are great for summer. Okay, yes. They do cause a problem with bra straps and then when wearing a strapless bra it keeps falling down, but with the right bra, off the shoulder tops open up a whole new side to fashion. Not only are they great for getting that bronzed look on your shoulders and not causing icky tan lines, they are again an essential for summer. Coming in long sleeved and short sleeved, there is a top for every occasion, and they are so easy to style with a throw on cardigan or a jumper if it is a bit chillier. Rain macs are the same and can take the chill off the breeze during that summer shower of rain, whilst allowing you to get you tan on, all in the same day! The best ones for wearing with dungarees are soft plain material, so that you aren’t hiding any detail with the denim front. The denim straps on your shoulders are never skin irritating, unless you have super sensitive skin to denim, in which case I would stay clear of this look. 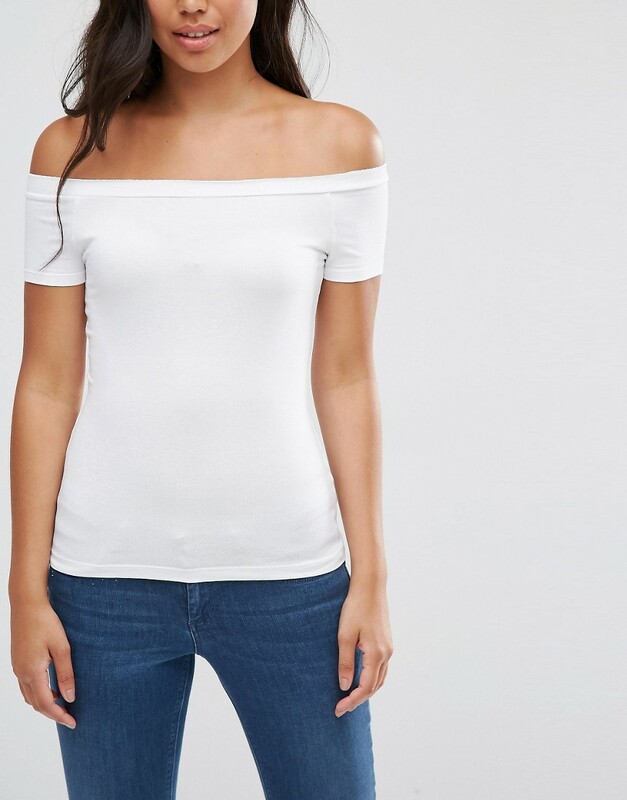 The off the shoulder look also allows you to stay cooler on a hot summers day, allowing you to have skin on show but not look too revealing. Again, pair these with your favourite fashion trainers and you are good to go! Here are a couple of examples you could wear, all found at Asos, all around the price of £10. These tops were huge last summer and I remember, when I walked into town to meet people, you almost certainly see at least 20 different girls wearing these tops. After Topshop launched their range, other stores followed, with these tops making an appearance in New Look and Urban Outfitters soon after. They are, of course, still able to be bought today and if you can’t find any in store, go online! 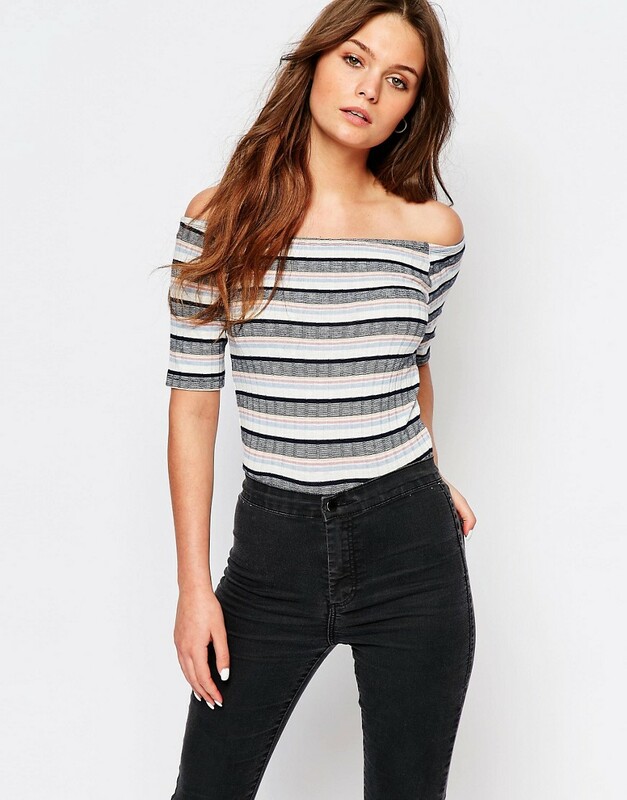 Asos have a huge range of long sleeved tops and Topshop and Urban Outfitters still have a wide variety of short sleeved choices online. 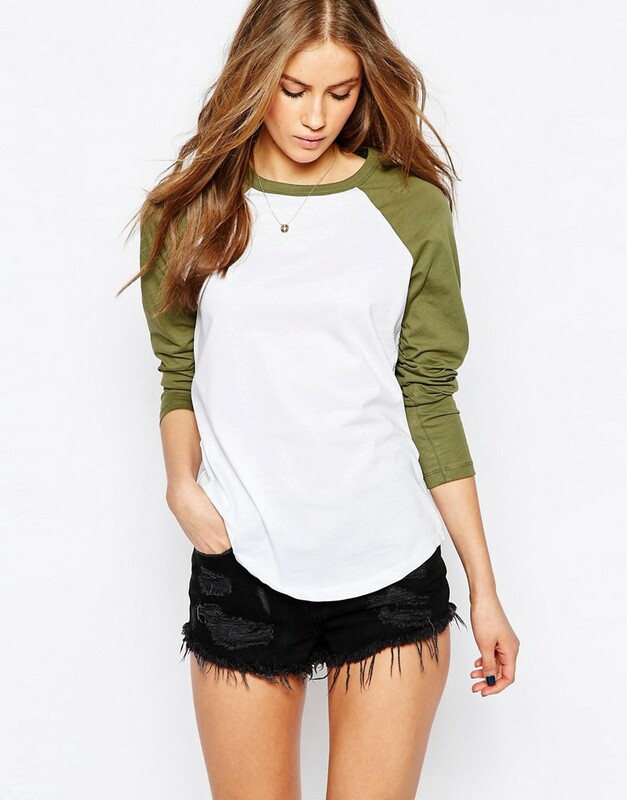 These tops are usually seen with a white main body and then with a black or coloured trim to the sleeves and neckline. This creates a pretty contrast and as a basic top, they look great underneath dungarees as you can still see the detail! Here are a few I have found on Asos, Topshop and Urban Outfitters. They range from £10-£30. I hope that I have given you some ideas and inspiration with how to wear dungarees, as I know I had no clue when I first bought mine. But after playing around with a couple of ideas I love wearing them, and in the summer they are one of my summer go-to’s. If you want any of the details for the photographs above, just give them a quick click, and a link will take you to the page. Go out and get shopping! Recently I went on a little shopping spree in Jack Wills where I was treated to a few items ready for my summer. These ranged from a couple of new pairs of jeans, shirts, and even a beautiful new dress. Here I will show you which products I love and what to pair them with, to ensure you have an amazing, fashion-filled summer. This is one of my favourite purchases. This dress has a cotton petticoat underneath the skirt, also made of cotton, which gives it lift, not too floaty but more rigid. This is nice for those days with the summer breezes and avoiding any flying skirt incidents! It has a lovely blue floral pattern with hints of red, and this print is one of their favourite prints, with it featuring on many other products, such as underwear, leggings and phone cases. I chose this over a dress with a spaghetti strap, even though I liked both, because it gives the top of the dress more structure and made it feel less like a beach dress and more like an everyday casual dress or for going out to dinner. This dress with a pretty cardigan from their range, for example the one on the right, (Horwich Lace Stitch Cardigan) would look beautiful and would just add that extra touch that makes up the outfit. Pair these with a pair of casual trainers or ballet pumps and you’re set to go! These two pairs of leggings are perfect for the summer when you just want to relax and stay warm in the evenings when the temperature drops slightly. Both have elastic Jack Wills embroidered waistbands which sit comfortably on your hip line / waist line, depending on the size you purchase. The patterns on both are easy to wear with other things, for example a plain tee with a zip-up hoodie on-top, a pair of flip flops, if you’re feeling adventurous, and you’re set. Both fit really nicely around your legs and hips and are both very comfortable against the skin. I would suggest buying them bigger rather than going down a size, even if this means you are buying a size bigger than usual, as they fit nicer around the legs with a bit of extra length. Saying this though, make sure they fit around the waist well and don’t drop down. Staff in-store are friendly and are happy to help with any queries you may have about fittings. Underwear from JW has always been my favourite, and even though they come at a slightly higher price than your quick buy down at Primark, they are worth the money, as they last a long time and are super comfortable. The waist band means they never feel like they are falling down. Because of them being made of 100% cotton (excluding elastics) they are soft and flexible to fit around the curves of your body. They come in a wide variety of patterns and colours and they have recently designed the same classic JW boy pant, but in a thong style, which is great for girls who like different styles but still want to consider being comfy. These also come in 3 packs which makes choosing between the many styles easier and for a limited time the single pants are 2 for £15. (£9.50 singularly). These two shirts are my new favourite tops to wear out. They are made of 100% cotton which makes them incredibly soft and comfy to wear. As a classic fit, rather than a slim fit, they still add to your figure because they are tapered not only at the bust but at the back also so they are naturally drawn in. Both colours are very easy to wear with denim or black jeans, and can be dressed up or dressed down by adding a few little accessories. Both are adorned with the JW logo, the pheasant, and this adds a lovely touch, coinciding with the trim around the inside of the collar and the sleeves. You can tuck the shirt in, leave it out, roll up the sleeves, keep them button and undo or do-up as many buttons to the collar as you want, depending on the look you are going for, but all of the options create a formal but casual look. With care (washing with similar colours and ironing before wear) these shirts will last a long time and can be used for many different occasions. I know Jack Wills isn’t for everybody, but every piece of clothing in their ranges are made beautifully and are very good quality. Yes, the prices may be higher than other stores, but I swear by Jack Wills for certain things and I just cannot find the same quality and feel about the clothes by other brands. All of these items can be found on the Jack Wills website. I hope I have inspired your summer and you step outside your comfort zone this season, and remember, you can rock any look you want if you coordinate each bit correctly! Just have a little search on Instagram or Tumblr, or even your favourite brands website and see what they have done! Anything looks good, its just the confidence sometimes needed to pull it off! Have fun girls!